Accessing your Category Listing Report(s) on Amazon provides you with an export of detailed product data for your catalog. Please note that the amount of data included on these exports is dependent on how much data you've provided Amazon Seller Central. For example, if you tend to only sell on existing ASINs and rarely add any information (such as Description, search terms, or bullet points), then your Category Listing Report is unlikely to include any of that information either. There are three steps you'll like to follow in order to download your Category Listing Reports. Ask for the feeds department. Ask them to unlock the Category Listing Reports. It is best to ask for them to unlock all of them in case you sell in more than one category. They should make these available for you within 1-2 hours, although it make take one full day. If it takes longer than a day, we recommend following up. The Default is for the reports to be available for 7 days. You can always call back and ask again. There are no limits to how many times. Now you have a list of categories for your catalog! 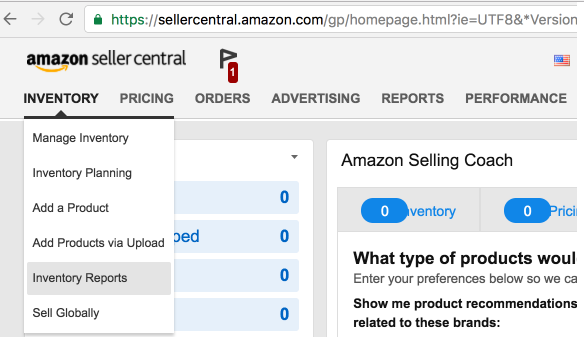 Go to your Seller Central homepage: https://sellercentral.amazon.com/gp/homepage.html? Click on the drop down where it says "Select Report Type"
Please request this report as a .txt or .tsv file and send to your Onboarding Specialist to have them imported.